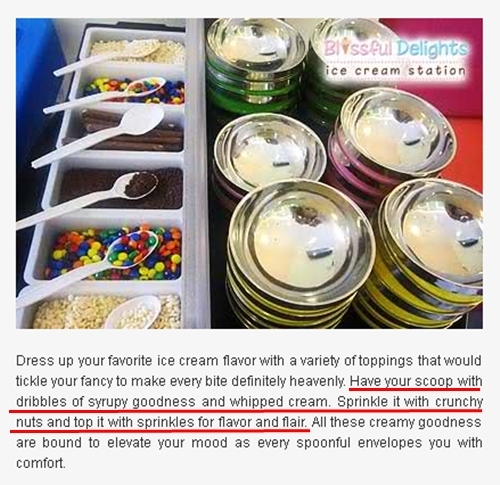 Blissful Delights is an ice cream parlor located in Sta. Cruz, Manila, just a short walk away from Rizal Avenue. The place serves different kinds of ice cream creations such as parfaits, splits, and sundaes, but also offers other food stuff like coffee, teas, pearl milkshakes, rice meals, burgers, and sandwiches. The resto also has an unlimited ice cream buffet that costs P200/person (all you can eat ice cream for two hours). We were able to buy vouchers for the buffet through Metrodeal and redeemed them last month. The experience was okay overall but slightly disappointing. During our visit, the flavors available were mocha, mango, coffee, and strawberry. I find mocha and coffee a little too close so the four flavors felt like three. If we had known there would only be four flavors available, we would have just bought a tub of 3-in-1+1 ice cream and chilled out at home. To be fair, the ice cream tasted okay and the scoops were huge and well-packed (big scoops of Big Scoop Ice Cream), so we did not have to refill again and again. The toppings were generous too -- more than enough for me and my partner -- and the cups were very cute. I was just disappointed with the limited options. I was expecting at least 8 flavors (a mix of classic and premium ones) and more choices for toppings. Maybe I expected too much, but I don't think my expectations were out of line. The ad specifically mentioned syrup, whipped cream, and nuts -- none of which were offered in the actual buffet. The pictures even showed berries, choco chips, choco sticks, and other toppings. And look at the ice cream! Those were not just four basic flavors. Group buying sites have never been the epitome of honest marketing (with the majority of their promos using stock photos instead of actual images) so when I see images from the actual merchant, I assume things would be more accurate. Why bother showing and mentioning stuff that are not part of the deal? 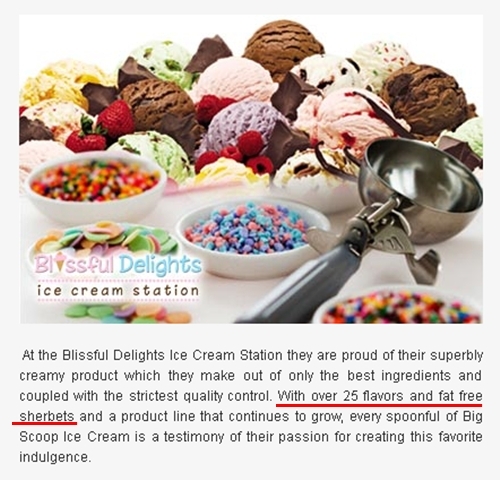 Blissful Delights can argue that "over 25 flavors and fat free sherbets" is only a description of their offerings and not of the buffet itself, but with the way the information was presented, to say that the ad was misleading would be an understatement. Okay, with my gripe about the ice cream buffet out of the way, let's talk about Blissful Delights' interiors, cleanliness, and service. The place is just small but the interior design is charming. The chairs have a modern design and the color combinations are appealing especially to the younger crowd. I just wish Blissful Delights would repaint their tables because the chipped paint makes the tables look old and worn out, in contrast to the modern look the place is going for. There is a second floor. This is where the stocks are kept and the cooks do their thing. This is also where the comfort room is located. Unfortunately, when I went to the CR, I learned that there was no TP and that the "liquid soap" did not really do anything -- it was more of a bottle of water with a dash of liquid soap. I really hope that the people who handle the food have another CR inside the kitchen, complete with soap and TP, for obvious reasons. As to the service, it was okay. We were attended to promptly and the staff were courteous. Getting the unli ice cream was a breeze and even though the place was small, there were several personnel available, which was good since by the time we were halfway through, the place was already packed with customers. The only odd thing was that the pot of hot tea we ordered took longer than expected to be served. Maybe because there were already a lot of people by that time and some of them were ordering hot food. 1410 Broadview Towers, Mayhaligue St.
this review really helps.. thanks..
Hi! To clear some things that you mentioned. Firstly, the unlimited ice cream buffet has 8 flavors namely: Chocolate, Vanilla, Strawberry, Coffee, Mocha, Mango, Bubble Gum Mallows and Chocolate Chocolate Chip. 4 was served at a time due to limited racks and ofcourse, the ice cream that was served should be consumed to be able to open a new flavor. Second, metrodeal was the one who put the description without our approval of what to put and the toppings that were described was the toppings for our past deal which is the Php 49.00 banana split instead of Php 180.00. Here is the link http://www.metrodeal.com/main.php?dealId=MTg2OA== The first day when the deal for the buffet was out, we told metrodeal about it but sadly they didn't change it. But we would like to thank you for reviewing us and hoping to be of service to you again next time. Hi Sandra. Thank you for the clarification. The shop was fine, and the offers are superb.Just had a review with the shop recently. another thing, Big Scoop is a High class ice cream brand that is being distributed in Sofitel and Yellow Cab just to name some. Coffee and mocha flavors are also distinguishable, based on our experience. About the promo, I guess it was just an honest misunderstanding between two parties. just take note that group buying deal sites are the ones who benefit most, and they exaggerate promotions just to get the attention of the customers. Nice review anyways coz it made me go to the shop personally. I've been seeing this small shop being featured in so many TV programs like The Good News and KMJS, maybe because of the goodness they offer. Very disappointing experience! we just went to this ice cream parlor Blissful Delights because we availed the unlimited ice cream promo in metrodeal, only to found out that their ice creams are LIMITED!! 5 days ago, i was trying to call for reservation but to no avail,their phone numbers were always busy, so we decided to go there,thinking that we will enjoy the promo, To our dismay, they didn't accommodate us, they told us that their ice creams are for limited persons only, I was asking if they can consider the four of us because we came all the way from QC, passing thru traffic and paid parking slot but they told us that the other customer might scold them if they allow us to avail the promo, even if I told them that we will just pay for the regular price and forget about the discounted promo,they didn't accommodate us either, I read the not "so good" blog from 1 of the customers, I still take my chances since her concern is just misunderstanding, but after we personally went there,I could have believe her and not bother to avail this kind of promo, as far as i know,an establishment or restaurant who are offering UNLIMITED and BUFFET means that they should have an overflowing of foods to cater the needs of the consumers, Blissful Delights should be ready for this kind of promo so that no more incident like this will happen.